This easy, any day saute uses inexpensive ingredients to make quick and flavorful results. The mushrooms pair well with most mains. You can even enjoy them on pizza! Add the mushrooms, garlic, crushed red pepper, and salt to the skillet and saute for 3 minutes. Add the broth and black pepper and cook for 5 minutes. 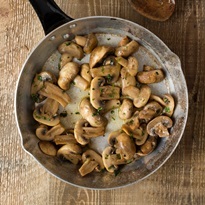 Remove the skillet from heat and sprinkle the mushrooms with parsley, if using.